5. Calculate 24 x (6 – 2). 9. 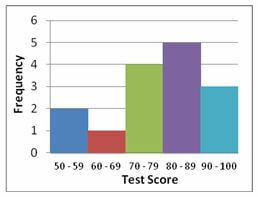 The test scores in Mr. Smith’s class are shown below. Create a histogram to display the data. 10. What unit of measure would be appropriate to use when investigating the attendance of nine different Broadway shows? 1. 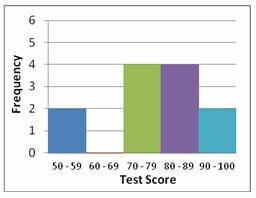 D: A ratio is a relationship between two numbers of the same type. For instance, if the ratio of apples to oranges in a basket is 3:2, then the basket contains 3 apples for every 2 orange. In the given problem, we are looking for ratio between the populations of two cities. Since we are told that the population of New York is about twice that of Paris, there are about two New Yorkers for every Parisian. Therefore, the correct ratio is 2:1. 3. B: The least common multiple (LCM) of two integers is the smallest (or least) integer that is a multiple of both numbers. One way to find the LCM of 8 and 12 is to list their multiples, and choose the smallest number that appears in both lists. Since 24 is the smallest number in both lists, the LCM of 8 and 12 is 24. 6. A: A solution to an equation or inequality is a value of the variable(s) that makes the equation or inequality true. To determine which choice is a solution to the inequality 9 + 2x > 5x, substitute each one for x in the inequality and simplify the result to see if the inequality is true. Start with x = 2. Since 13 > 10 is true, the correct answer is x = 2. Alternatively, subtract 2x from both sides of the inequality to get 9 > 5x – 2x, which is equivalent to 9 > 3x. Divide both sides by 3 to get 3 > x, or x < 3. The only x to choose less than 3 is 2, so A is correct. 8. A: The mean of a data set is its average. Therefore, unless all of the values in the set are 12 (and you know they are not because the range is 8), some of them must be less than 12 and some must be more than 12. The range of a data set is the difference between its largest and smallest values. Since the range of this set is 8, all values in the set have to be greater than 4. If one value was 4, there has to be a value greater than 12 to ensure the average stays 12, and the difference between that value and 4 would be more than 8. Since we know the range is 8, 4 could not be a value in the set. 9. 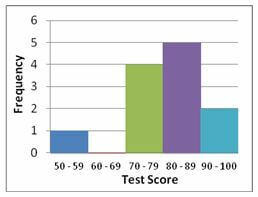 A: A histogram is a way of graphically representing the distribution of a data set. 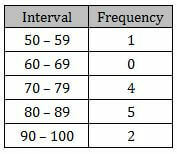 In a histogram, the data range is divided into intervals so that every value falls in one interval. 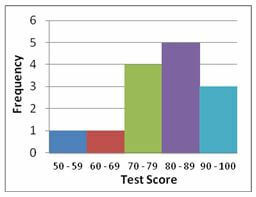 For the given test scores, one natural way to set the intervals is 50 – 59, 60 – 69, 70 – 79, 80 – 89, and 90 – 100. 10. C: The appropriate unit of measure of a quantity corresponds to what you are counting when you measure it. For instance, if the price of a car is $40,000, because you are counting dollars, the unit of measure of the quantity $40,000 is dollars. To measure the attendance of the Broadway shows, you count the number of people who go to each show. Therefore, the unit of measure is people.